END, OREGON – With less than a month’s planning and organization, Western Music Hall of Famers R.W. 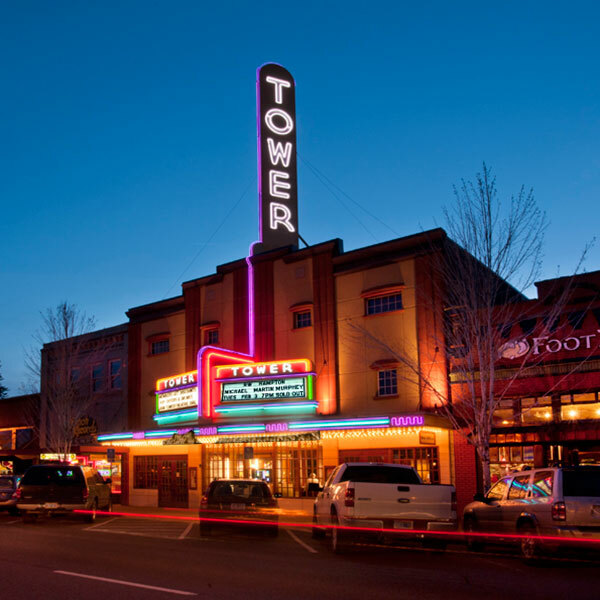 Hampton and Michael Martin Murphey played for a SOLD OUT audience on February 3 at the Tower Theater in Bend, Oregon and raised over $7,250 from ticket sales and a signed guitar auction after all the expenses were paid. The show benefited the Bend Chapter of the Oregon Band of Brothers. The concert was inspired by a chance meeting R.W.’s wife, Lisa had at dinner one night with Medal of Honor recipient, Bob Maxwell, one of the key members of the Bend veterans group. The very charming & genuine Mr. Maxwell, who is currently the oldest living Medal of Honor recipient, served in WWII and lives in Bend Oregon with his wife. Produced by Lisa, and her company Parallel Productions with the help of the local group High Desert Western Arts Association. The two Western Music icons entertained the packed house with stories and songs, backed simply with their acoustic guitars. Emcee Ted Lyster sharing a few poems, then Murphey opened the show with his trademark “Lone Cowboy” concert, playing everything fromt he obscure to his standards “Wildfire”, “Carolina in the Pines”, “Geronimo’s Cadillac” & “Cowboy Logic”. Hampton followed with a variety of songs from his original cowboy albums to a set dedicated to the veterans that started with a stunning acapella version of “Danny Boy”, and included new favorites “Hell in a Helmet” and “My Country’s Not for Sale” both from his latest CD, This Cowboy, that were written during his oldest son’s tour in Afghanistan with the US Marine Corp. He brought the house to their feet with a duet that featured his 14 year old son, Calvin Danner, on a Mary Fahl song, called “Going Home” (from the made for TV movie Gods and Generals). At the end of the night, Murphey joined Hampton and his son onstage for a rousing version of Hampton’s song “Born to be a Cowboy”. The Bend Chapter of the Oregon Band of Brothers started in the fall of 2006 when WWII veteran Phil Bellefeuille coordinated a few of his veteran friends to meet for coffee at the Elks on Tuesday mornings. It quickly grew to lunch on Mondays and included enough veterans that they were switching restaurants weekly and created a book with a biography for each veteran member. Eventually they settled into Jake’s Diner for their weekly meetings and developed into a 501c-3 with the ability to raise funds for not only their own veteran members but also for other veterans groups in the community. Now including veterans who have served from WWII to the present conflicts, they offer not only comraderie but also a way to serve the physical, financial and emotional needs of all veterans in the community.